Single Moms Planet was founded by Neferteri Plessy with the purpose of bringing attention to the unique plight of single mothers and to remove the barriers that stand between a better life for them and their children. As we are learning, single mothers are like a mosaic, made up of all different races, cultures, professions and economic status. Ms. Plessy’s mission is to help balance the lives of single mothers and their families by empowering them through comprehensive programs of mentorship, financial literacy & aid, family & health counseling and entrepreneurial training. Singe Moms Planet has created a support network where single moms can share life experiences with each other, allowing them to become empowered, stronger resilient and ready to persevere. Participants in our mentorship program have experienced becoming more financially free, entered into happy healthy relationships, found new or more rewarding jobs, and have even started their own businesses. Single Moms Planet hosted their 4th annual Mother’s Day Celebration, The Single Mom’s Awards, at The Peninsula Hotel in Beverly Hills. This special day honors selected women and corporations who are making a difference in their home and community. We were hosted in a beautiful ballroom, complete with all the details for the grandest high tea. The event was hosted by NBC 4 Los Angeles reporter Beverly White and author/TV personality Rosie Rivera, sister to late banda singer Jennie Rivera. Among the guests were NFL stars DeSean Jackson, and Rodger Saffold, as well as actors Daphne Wayans, Carrie Stevens, Christy Buss, Alyssa Reeves and many others. The honorees were Kelly Vlahakis-Hanks, Earth Friendly Products CEO who was honored for Business Innovator of the Year; Gayle Jackson, Co-Founder and CEO DeSean Jackson Foundation, Sports Mom of the Year; Joanna McFarland, Carolyn Yashari Becher and Janelle McGlothlin, founders of Hop Skip Drive founders, Corporation of the Year; Christy Salcido, senior vice president, Ketchum Inc. Visionary of the Year; Jan Perry, general manager, Economic & Workforce Development, Leader of the Year; and Karla Keene, CEO Clarity RX, Entrepreneur of the Year. 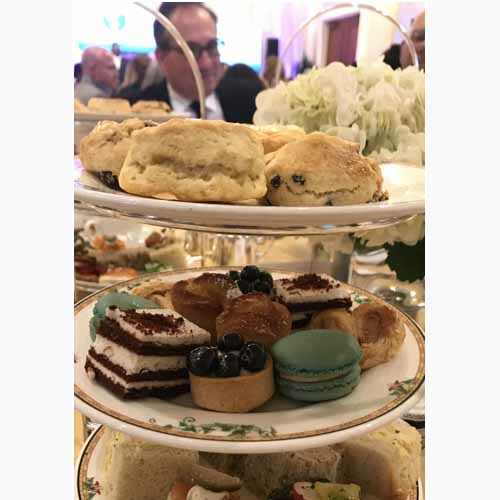 Among this year’s presenters were Los Angeles Rams running back Todd Gurley, actor Tom Williamson (“The Fosters”), TV producer Kerri Zane, entrepreneur Anastasia Soare, founder of Anastasia of Beverly Hills, and noted fashion blogger Heidi Nazarudin. Below are photos capturing this delightful celebration. Gayle Jackson(center) | CoFounder and CEO DeSean Jackson Foundation | Sports Mom of the Year w/DeSean Jackson (wide receiver for the Tampa Bay Buccaneers) and daughter A’Dreea Jackson in support of their mother. The Honorable Jan Perry was presented the Leader of the Year award by Todd Gurley II running back for the Los Angeles Rams. Rodger Saffold, LA Rams Players; DeSean Jackson wide receiver for the Tampa Bay Buccaneers; Jamon Brown, LA Rams;Todd Gurley, LA Rams. Showing their support of Single Moms Planet. Elegant Afternoon Tea table setting for all guest. Delicious Tea Sandwiches and macaroons.